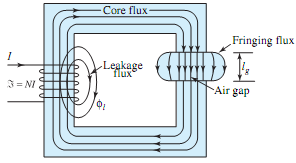 Consider the magnetic circuit of Figure with an air gap, while neglecting leakage flux. Correct for fringing by adding the length of the air gap lg = 0.1 mm to each of the other two dimensions of the core cross section AC = 2.5cm × 2.5cm. The mean length of the magnetic path in the core lC is given to be 10 cm. The core is made of 0.15- mm-thick laminations of M-19 material whose magnetization characteristic is given in Figure. Assume the stacking factor to be 0.9. Determine the current in the exciting winding, which has 100 turns and produces a core flux of 0.625 mWb. What are ultrasonic sensors made of? What is a good online source to find information on a basic level about ultrasonic sensors? Nodes analysis Analysis using KCL to solve for voltages at every common node of the network and as determines the currents by and voltages across every elements of the network.